"Solstice" is an evolving installation piece. Solstice is linked to the current state of the sun. A “real-time” image of the sun is projected through a series of refracting prisms. Solstice uses data collected from NASA satellites to control the image’s brightness, as well as the speed and direction of the prisms’s rotation. I was interested in exploring our relationship to the natural environment as it becomes more mediated through increasing layers and layers of technology. 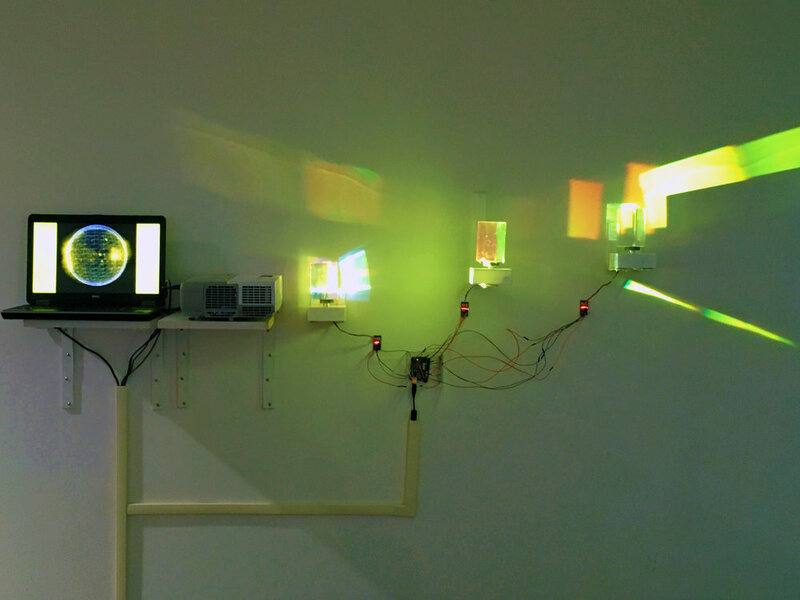 As I developed and fabricated the piece, I also realized that in many ways I was also deconstructing sunlight into data, and then reconstructing it from the same data sources. I wanted to take sunlight away from being a physical sensory experience, and only interface with it through pure data. Has our relationship to the natural environment, by extension this idea of IRL (in real-life), been fundamentally altered by our increasing use of digital systems of engagement and interaction?